WPScan is a free, for non-commercial use, black box WordPress vulnerability scanner written for security professionals and blog maintainers to test the security of their sites. 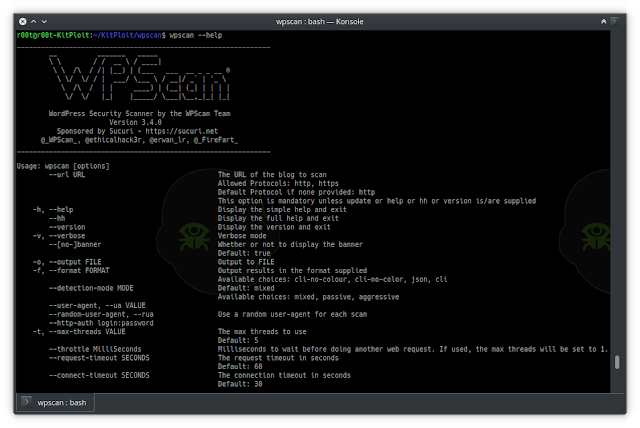 wpscan --url blog.tld This will scan the blog using default options with a good compromise between speed and accuracy. For example, the plugins will be checked passively but their version with a mixed detection mode (passively + aggressively). Potential config backup files will also be checked, along with other interesting findings. If a more stealthy approach is required, then wpscan --stealthy --url blog.tld can be used. As a result, when using the --enumerate option, don't forget to set the --plugins-detection accordingly, as its default is 'passive'. If you need to purchase a commercial license or are unsure whether you need to purchase a commercial license contact us - [email protected]. Any Contributions assume the Contributor grants the WPScan Team the unlimited, non-exclusive right to reuse, modify and relicense the Contributor's content. To the extent permitted under Law, WPScan is provided under an AS-IS basis. The WPScan Team shall never, and without any limit, be liable for any damage, cost, expense or any other payment incurred as a result of WPScan's actions, failure, bugs and/or any other interaction between WPScan and end-equipment, computers, other software or any 3rd party, end-equipment, computer or services.